Owing to our hard working professionals, we are to offer Children Water Bottle / Plastic Water Bottle Spiderman. 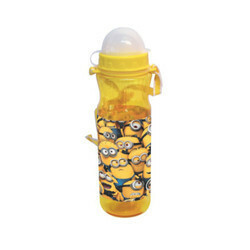 These durable and trendy bottles are manufactured using quality plastic which makes them safe for small children. Our bottles are available in light purple color, which makes them attractive. For further enhancement of its looks, our vendors make use of eye catchy stickers. 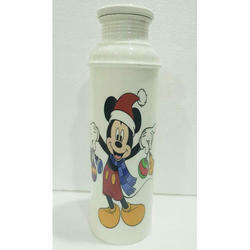 Kids Water Bottle is crack resistant and has fine finish due to which it is highly appreciated among our esteemed clients. Plastosil Moulds is geared to mee the ever-evolving requirements of our respected clients, we are offering a premium quality range of Baby Products & Child Care sector, our agenda is clear, ie meet the expectations of the clients by rolling out quality products that will help us to retain and inturn give us repeat business from them. Relying on our familiarity with the industry over years, we have placed us in the top string of the industry by offering Stainless Steel Kids Water Bottles. Our distribution network allows us to help in quick and convenient delivery in a matter of time at your doorstep. They are made an interesting proposition by their features such as optimum finish, fascinating look and rugged construction. - 7.0 cm *13.5 cm.